I was driving out to the North Fork of Long Island with an old friend who was visiting from Palm Desert a couple of weeks ago when his cell phone rings. He dives deep into his pocket and pulls out a familiar relic that I hadn’t seen in some time: a flip phone. I laughed. But not all that long ago, the flip phone was as uber-cool as, well, Uber is today. And while my friend, Joe, may not feel the need to be connected all-ways-cyber in the way that I do, his cell phone makes and receives calls with no less precision than mine do. It was clear how out of place the iconography of the flip phone was amidst my mobile gadgetry. In its day, the flip was cutting edge, however, and its design evidently sound enough to withstand years of use. But, as I told Joe, sometimes you have to keep up with the times. Today, especially in the U.S., old rules of all kinds are transforming—from Constitutional interpretations and laws, to culture and technology. 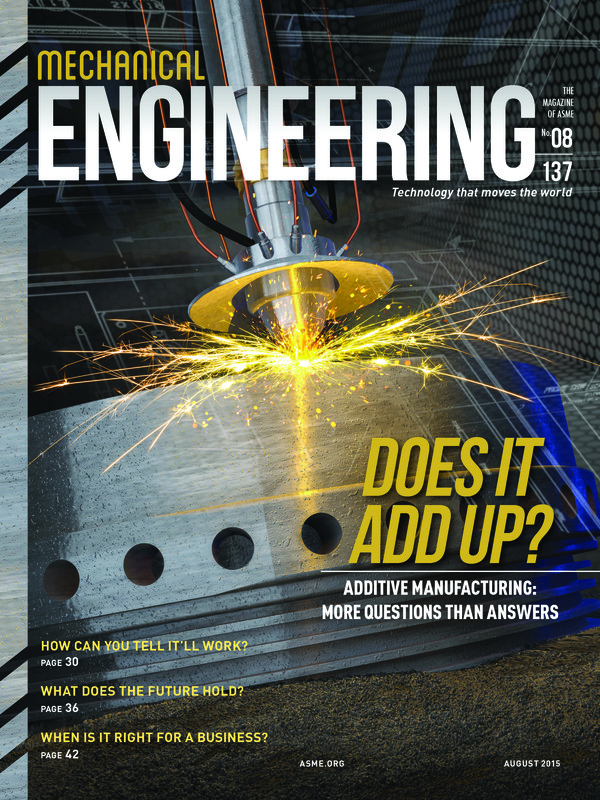 It’s not clear how transformative all of the current social and technology disruptions will become, but when it comes to advanced manufacturing, and especially 3-D printing—our editorial focus this month—it won’t be long before it’s a game changer in certain applications, especially biotechnology, aerospace, defense, and power generation. One of the most noteworthy examples of transformative innovations is the Model T, circa 1908. It was understood that its design was revolutionary, like the flip phone in its day, but how bravely transformative Henry Ford would be could not have been predicted at first. It wasn’t simply about design, but also his manufacturing processes that made Ford unique. The assembly line he shepherded in 1913 was pivotal in mass producing affordably priced cars. I bring up Ford because he left us three lessons that are valid in today’s changing environment. First, design with your customers in mind. Ford grew up on a farm and wanted to make the Model T nimble enough to handle well even on bumpy dirt roads where some of his customers resided. He designed a suspension system with a triangular configuration that allowed the front and rear axles to flex without damaging the engine. Second, don’t overlook what’s going on behind the scenes. Even as the assembly line was adopted in other industries, Ford took advantage of this concept and became the first automobile manufacturer to combine precision components with continuously moving assembly to build cars. By 1914 Ford was producing far more cars than any other competitor. Third, don’t be afraid to go against the grain. Having the steering wheel on the left side, as we’re used to now, was not standard in the U.S. It was a design decision that changed the entire auto industry. Today’s innovators are taking a cue from Ford and are not afraid to do things their way. Those involved in 3-D printing are an example.